25-Sep-2006: This is rather out of date. Look for an update Real Soon. Welcome to White Rats Morris' pages. 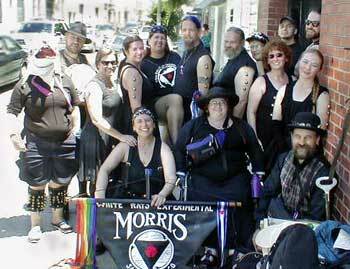 Based in San Francisco (California, U.S.A.), we are, as far as we know, the world's first queer/pervert/leather Morris team. You can get White Rats memorabilia from the White Rats Cafe Press store. For press info, look here. Web design by Watercourse with assistance from Homebrewed Websites with yet more edits by Carl Zwanzig.